My journey into cosplay has been a slow one. My first cosplay was as the 11th Doctor. Tweed sports jacket, dress shirt, bowtie, suspenders and skinny jeans? No problem. That’s practically what I wear to work on Fridays. This was my regular cosplay for a few conventions. Fans know what you’re doing, but to anyone on the subway, you look like an average 20 or 30 something Brooklynite. How normal does the 11th Doctor outfit look? 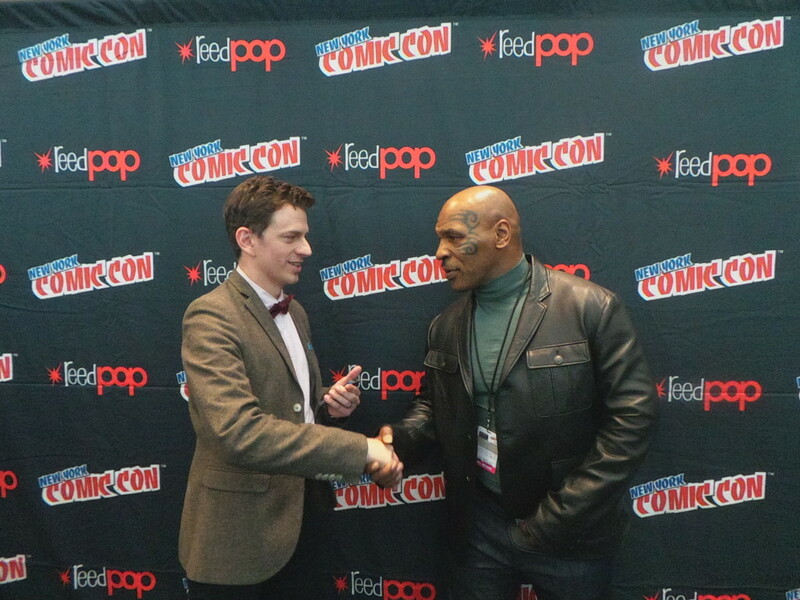 I interviewed Mike Tyson at NYCC 2014 in it and nobody batted an eye on how I was dressed, except for the one publicist who said I always dress snappy for interviews. This year though, I wanted more. I wanted to dress up every day of NYCC and I wanted my cosplay to be more than my usual office wear paired with a sonic screwdriver. So I plotted and planned and ordered maybe one too many spandex outfits. Here’s a big tip for anyone planning to cosplay to NYCC (or any big convention) next year: order far in advance. The companies that specialize in cosplay get hit hard during convention season, and what might be a 3 week turnaround time for them during the winter becomes a 12-16 week wait when SDCC and NYCC are nearing. I found this out the hard way. I ordered a very high quality Spider-Man suit from The RPC Studio. I was psyched for it to arrive. Sadly, NYCC has come and gone and my suit is still being processed. Bummer, I know. But I don’t blame RPC. I should have ordered sooner and not at the edge of their delivery window. 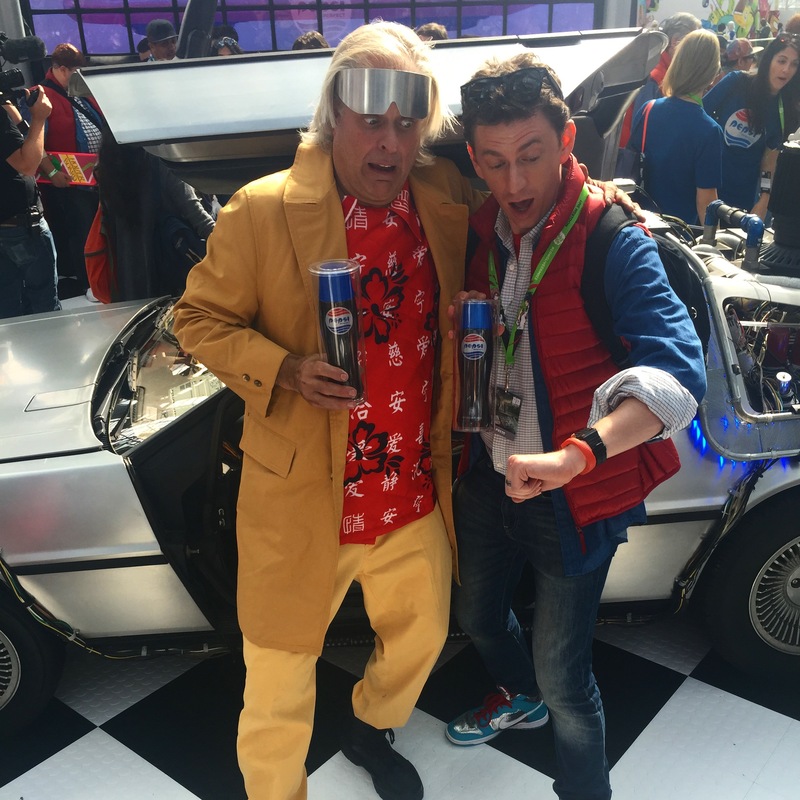 Marty McFly was my Day 1 cosplay for NYCC. This had many benefits: no mask, plenty of pockets, and Pepsi was giving out the very, very limited edition bottle of Pepsi Perfect from Back to the Future 2 to fans dressed as Marty. When I heard this, I was tempted to abandon my other cosplay plans and dress as Marty every day. Okay, not really a big step from the 11th Doctor. 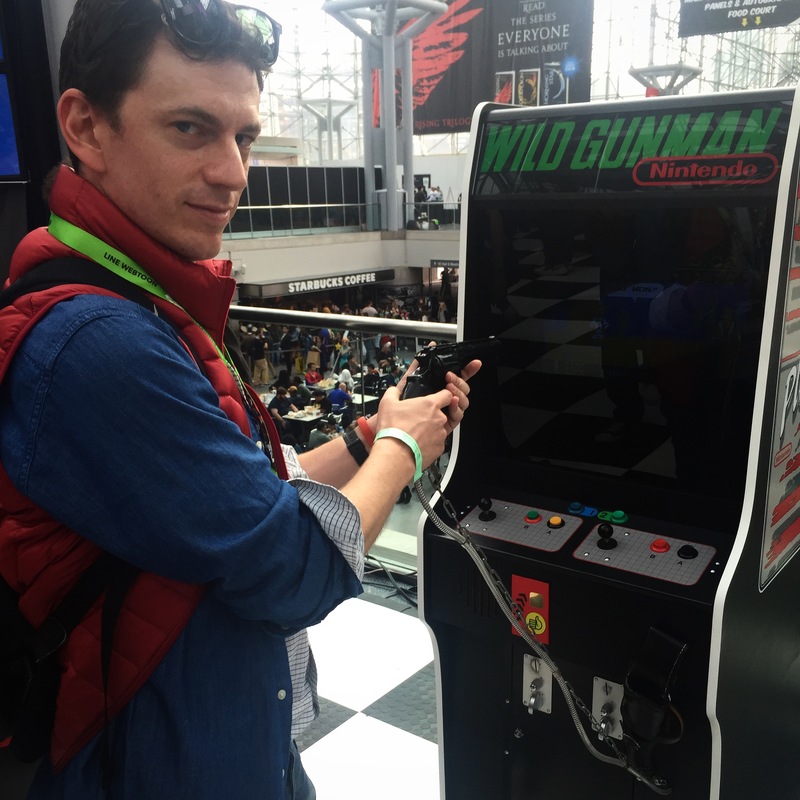 Dressing as Marty McFly gets you zero second looks on the subway. 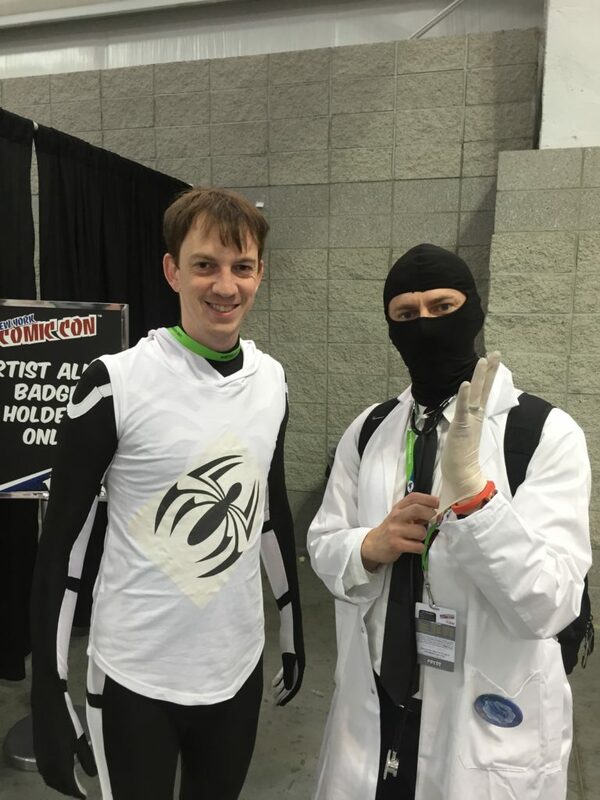 Dr. McNinja was my Day 2 cosplay. Dr. McNinja is very easy to put together: black pants, lab coat, ninja mask, prop sword – your whole outfit is one reasonably priced Amazon order. I really thought this outfit would get a lot of love. Clearly I have overestimated the size of Dr. McNinja fandom. The people who did recognize my outfit really loved it; one guy gave me a high-five, but I’m guessing more people though, “I don’t know, anime something.” The amazing thing is, when I stopped by Joe Prado’s table in Artist Alley, he immediately said, “What’s up, Billy?” I WAS IN A FULL NINJA MASK. How did he know? “You have very distinct eyes.” Why, thank you, Joe Prado! It was on the weekend that I went for the deep dive. Thursday and Friday were the training wheel days. Pants with pockets. Outfits that easily helped me blend in with a few minor changes. Not so on Saturday and Sunday. I went double-Deadpool Saturday and Sunday. I really wanted a Deadpool costume, but Deadpool might be the most overplayed cosplay at conventions, so I decided to dress as Deadpool, but not the standard, Rob Liefeld designed outfit. On Saturday, I dressed as Zenpool, Deadpool’s AXIS-shifted peaceful persona. 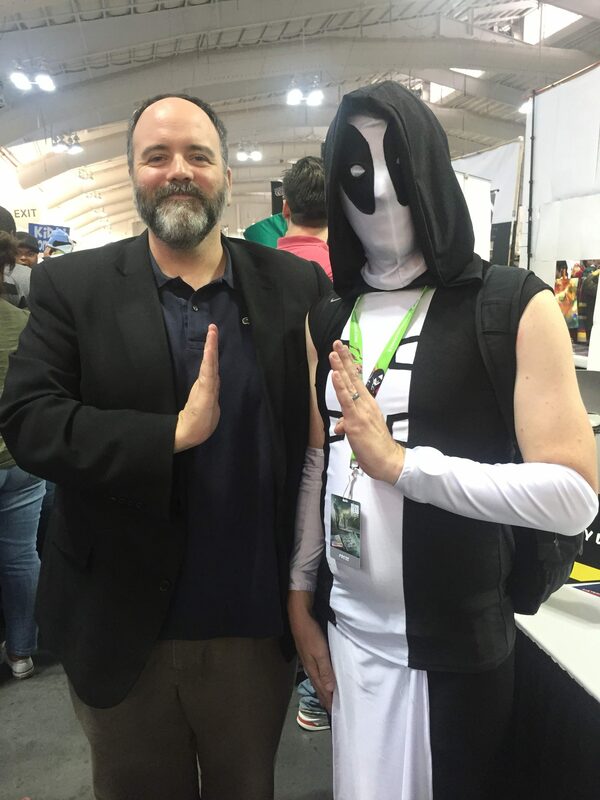 I even took a picture with Zenpool co-creator Gerry Duggan! He seemed psyched that people were dressing as Zenpool. 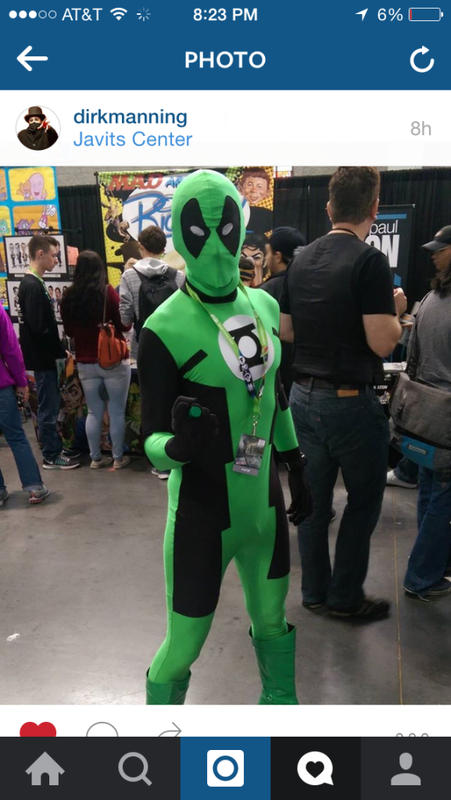 On Sunday, I wore what ended up being my most popular outfit of the weekend: Green Lantern Deadpool. 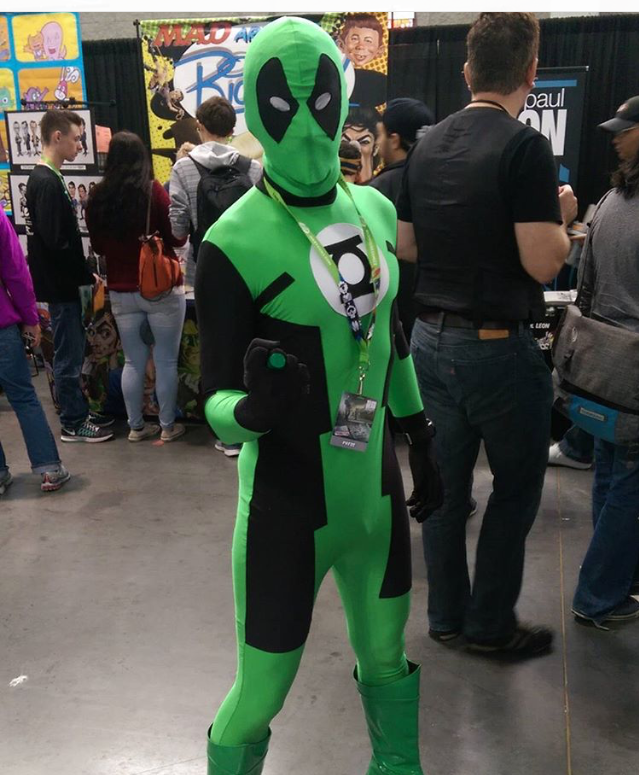 A LOT of people stopped to take my picture, I think mainly because the Ryan Reynolds line in the trailer for the upcoming Deadpool movie where Deadpool requests that the costume just not be green, an obvious dig at the Green Lantern movie Reynolds starred in. I had that line thrown at me A LOT on Sunday. It’s funny, this was a total last minute costume and I wasn’t even sure how good the quality would be. I ordered it from a dirt cheap seller somewhere in Asia on eBay. I just needed something to replace the Spider-Man costume that didn’t look like it was arriving on time. The Green Lantern Deadpool people were great. They rushed my order at no charge and I had my costume the Monday before NYCC. I think I ordered it 10 days earlier. The quality was great. The Green Lantern logo is actually sewn on, it’s not a dye sub. And the price couldn’t be beat. The green boots that I ordered off Amazon were the most expensive part of the costume. The major downside of this costume though was having no pockets. I was constantly worried that someone was going to take my wallet and phone from my backpack. Next year, I need to invest in green Deadpool belt. UPDATE (December 2015): The Spider-Man costume finally arrived and it is AWESOME. The RPC Studio gets my highest possible recommendation! I can’t wait to wear it at SE: NYC 2016!